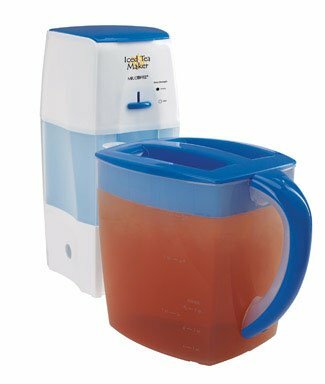 Mr. Coffee 3 Quart Ice Tea Maker by Sunbeam at Rat Coffee Shop. MPN: TM75. Hurry! Limited time offer. Offer valid only while supplies last. Sold as 3 quart at $23.43 per quart. (1 quart = each.) 3 quart. Steeping lever to select your favorite brew strength. Brew tea bags and tea leaves. Sold as 3 quart at $23.43 per quart. (1 quart = each.) 3 quart. Steeping lever to select your favorite brew strength. Brew tea bags and tea leaves. Water window. Auto shut off. On/off indicator light. Dishwasher safe pitcher. Removable brew basket. Boxed. Manufacturer number: TM75. SKU #: 68422. Country of origin: China. Distributed by Sunbeam Products,, Inc.